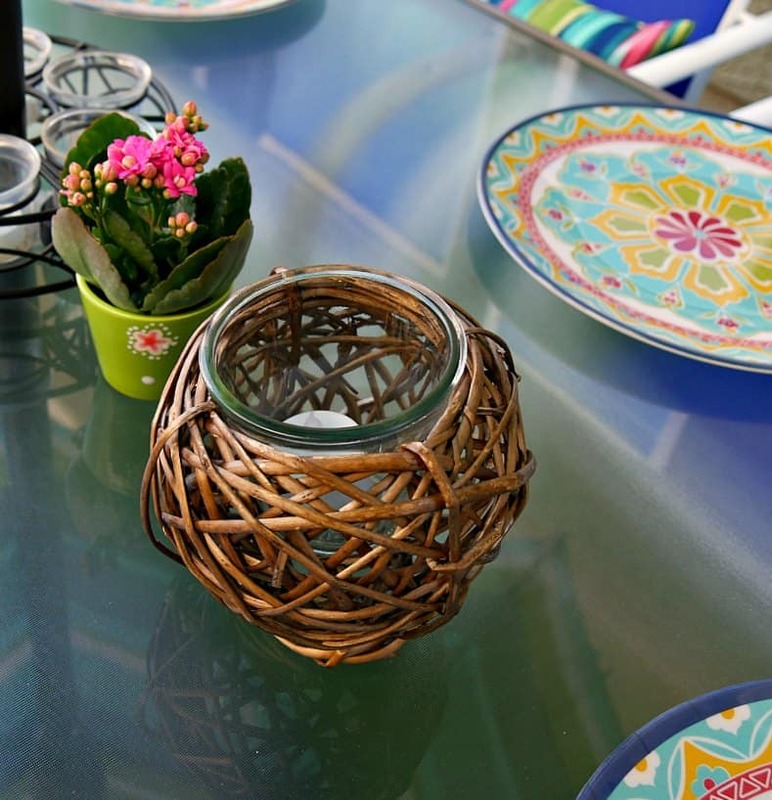 Turn your urban yard or patio in to an outdoor oasis with these small backyard ideas and the help of our sponsor, Lowe's! We bought our current home, an urban town home, 8 years ago. Our town home is in a building with 3 other town homes. 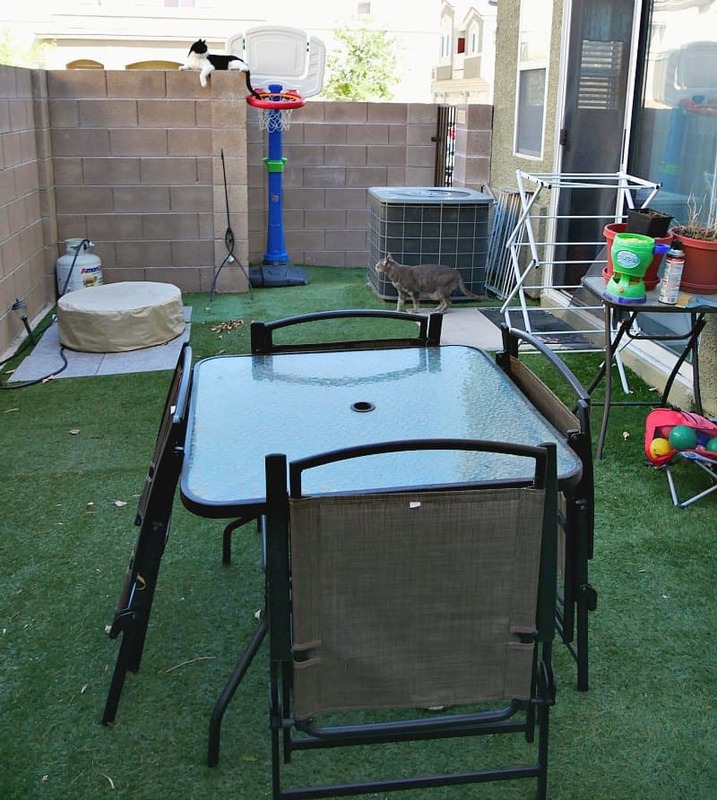 Land is scarce in Las Vegas and most homes have small backyards like ours. 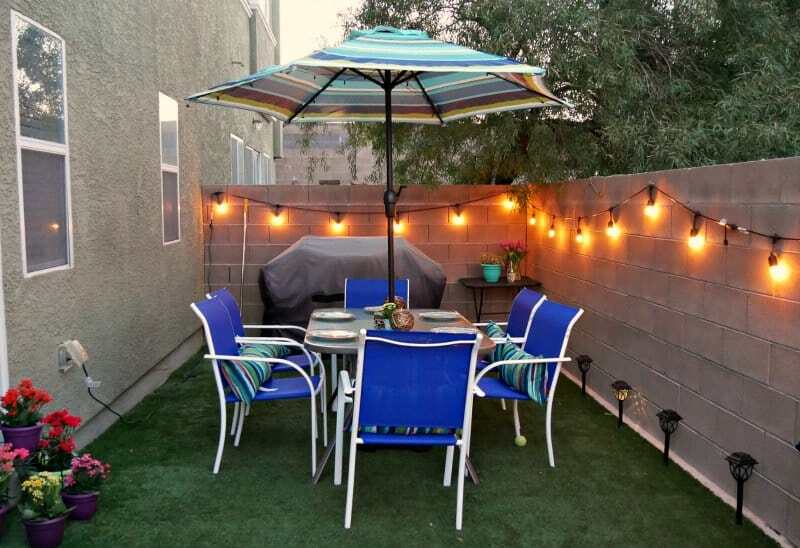 Our backyard is more the size of a large patio at a mere 200 square feet. 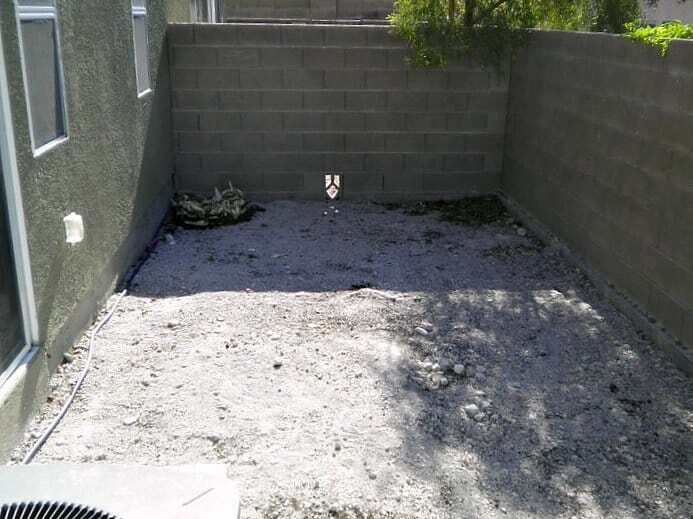 When we bought our home, the backyard was a big pile of unfinished dirt and rusty nails. Not exactly somewhere we let our kids play or wanted to spend a lot time. Two years after we had moved in, my parents gifted us by having the backyard finished with turf. It was such a huge improvement! Our kids were only 1 and 3 at the time so the backyard was their domain with toys and slides and mostly child sized everything. Our kids are now 8 and 10 and they lost interest in little slides a long time ago. Our small back yard was in disarray with a bunch of old toys; a table I didn't love; and was mostly unused except for grilling. I had a vision that our backyard could be a colorful, cozy oasis that added another living space to our home. Instead, we had a too small brown table and chairs; dead plants in ugly pots; laundry racks far past their prime and a lot of miscellaneous junk. We did buy a small gas firepit last summer. While it did some ambiance, it wasn't exactly what I had hoped for in our small backyard. Now with spring fully underway in Vegas, we went to Lowe's and did a total backyard makeover. I could not be more thrilled with the results! I had three goals in creating out door oasis: 1) bright colors; 2) plants and flowers and 3) amazing mood lighting. I was able to achieve all three goals just shopping at Lowes. I happen to love bright vibrant colors. And with a walled in backyard, I knew I needed lots of color. 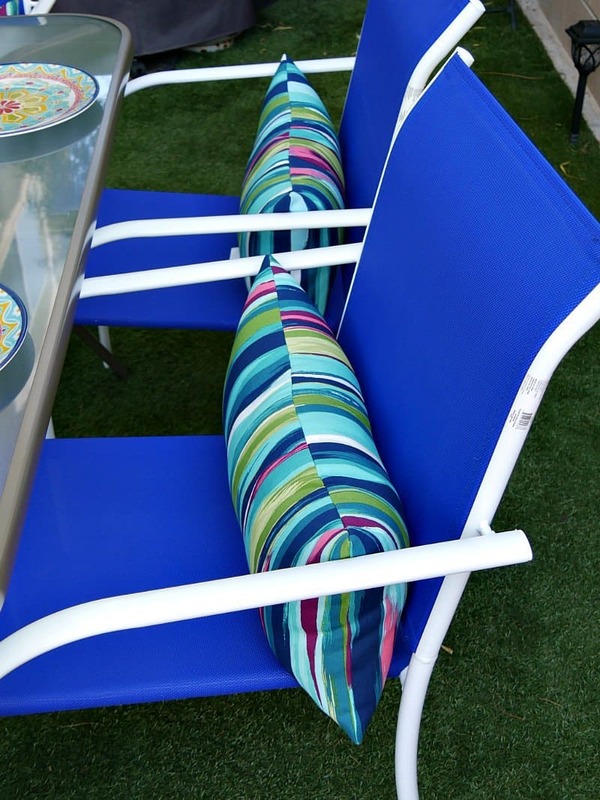 I added color to our backyard starting with the chairs I chose for the table. Lowes had bright blue or bright red chairs and I went with the blue. Colorful lumbar pillows added in shades of green, purple and pinks. A 7.5 foot umbrella is the perfect size for a small backyard. We tried a 9 foot umbrella and it was too big for our space. Lowe's has a lot of different colors and patterns in that size. We went with stripes to match the pillows. I didn't want just blues in the yard, though. So I looked for ways to incorporate the pink, green and purple that is in the pillows. 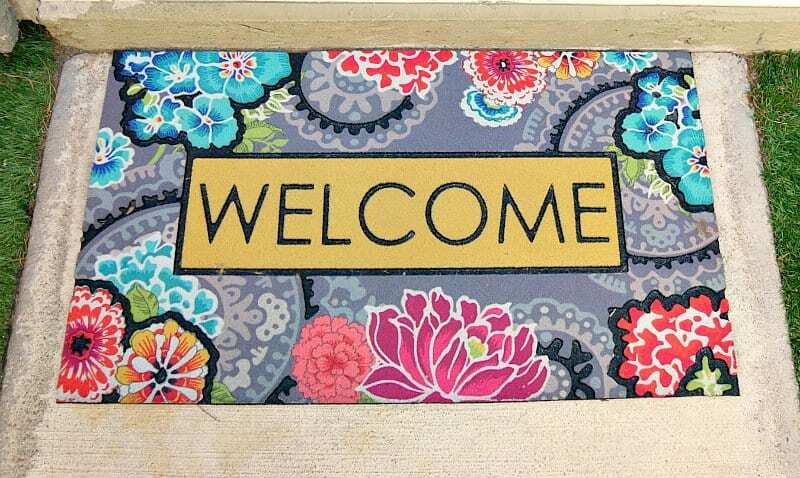 This colorful welcome mat is right outside the sliding door to the house. I had planned to hang pots with flowers on the cement wall, but I placed them on the ground right next to the welcome mat as a staging area. I liked it so much that I just left them there. 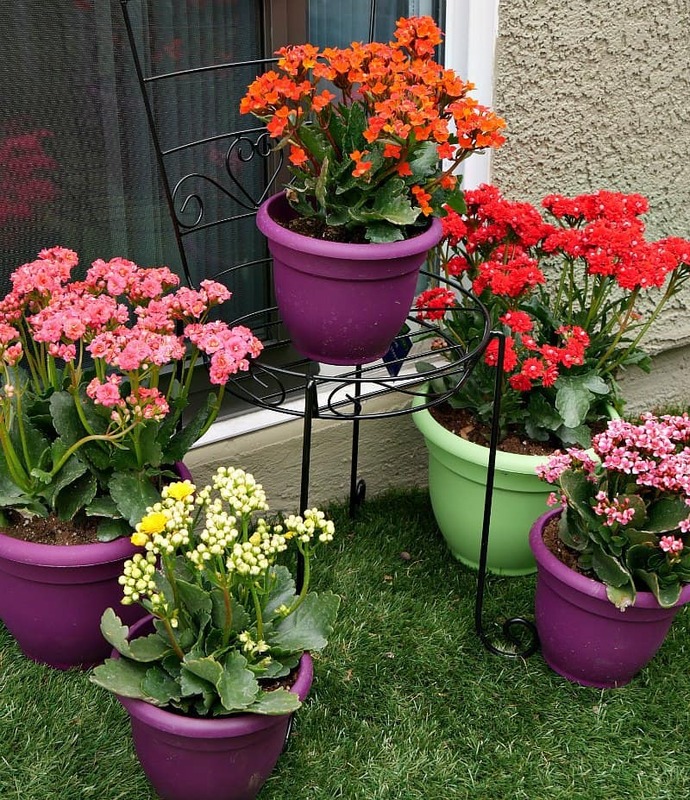 I purposely chose green and purple planter pots and added in bright colored pink, yellow, and orange flowers. I don't exactly have a green thumb, but I really felt like I needed living plants in the yard. So in addition to the potted flowers, I also chose hanging basket plants to add to the opposite corner of the yard. We put a metal shepherds hook in the corner to hang the plants. I chose plants that could withstand our hot summer heat and didn't need direct sunlight since most of the yard is shaded. The flowers in the pots near the door are actually from the cactus family. 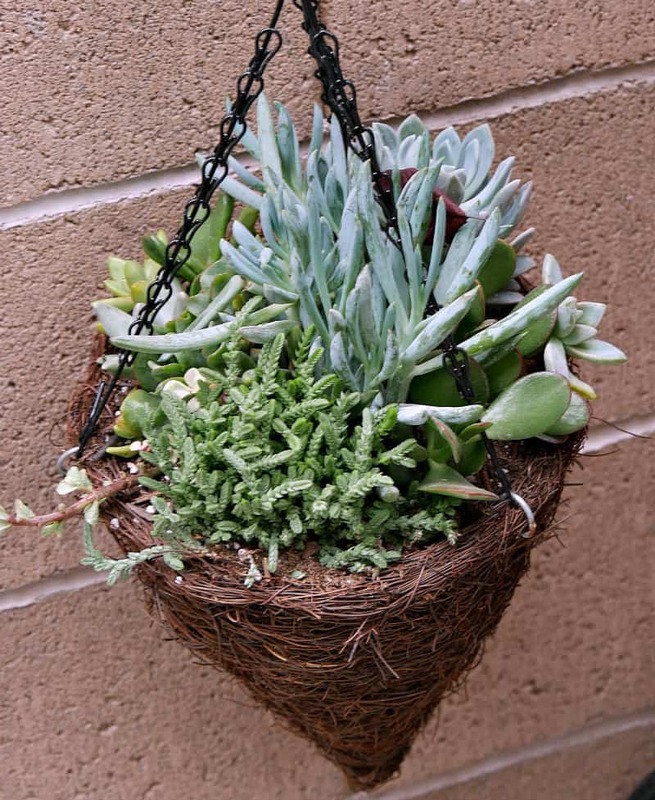 The hanging plants are made up of succulents and cacti that fit our desert climate. Both were available in Lowe's garden area. The Lowe's garden specialists were very helpful in finding the right plants for our yard. Make sure to grab flowers and plants that work well in your climate. The only original lighting in our backyard is one very bright and tacky light bulb. It's more like a spotlight and was not exactly mood setting. 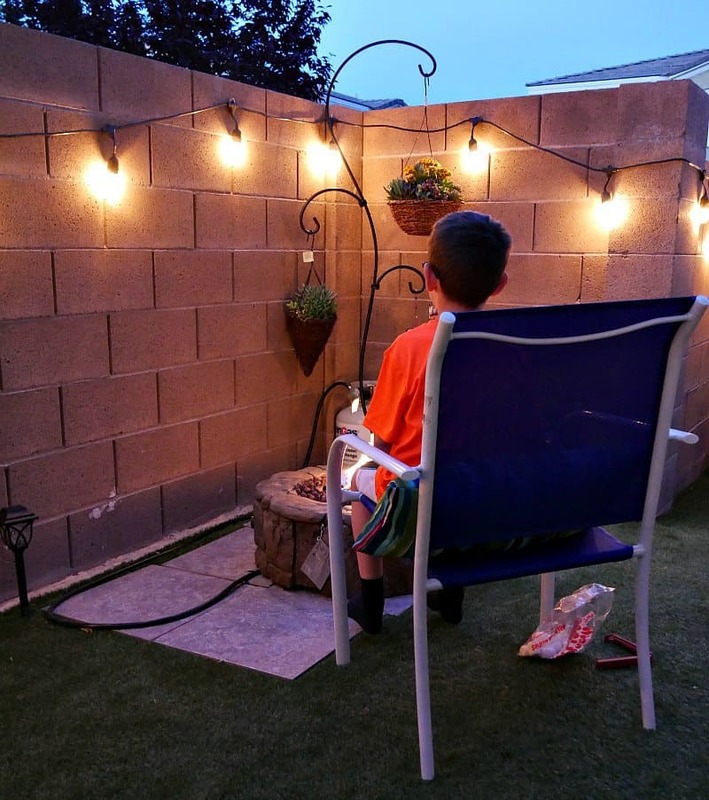 Thanks to a few strings of Edison lights and some help from a Lowe's associate and a drill masonry bit, we now have gorgeous outdoor lighting. 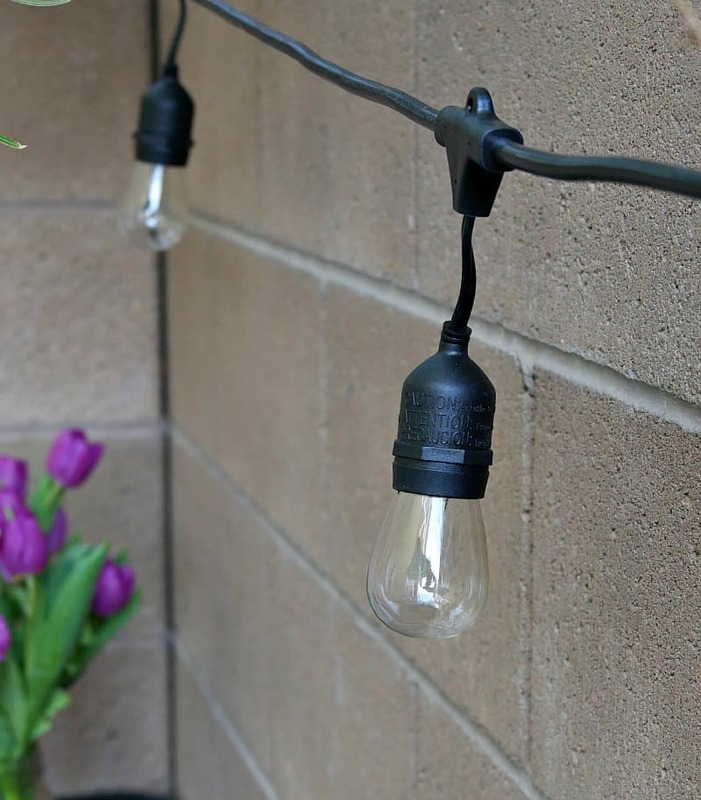 Don't be afraid to hang lights or decor from a cement wall. It was actually very easy to do with a masonry bit on a regular drill. The string lights give off a light of nice light. But I also wanted lights on the umbrella. This umbrella light set is solar. They charge all day in the sun and turn on automatically when it gets dark outside. We replaced the small solar lights along the wall to add ambiance as well. These lights are great for walkways, too. These charge during the day and turn on at dark. They don't give off a ton of light, but they do add a nice glow. On the table, I added a couple of wicker votive candle holders. I put electric tea lights in them. The flowers are actually the same exact flowers in the pots on the ground behind the table. The results on our backyard are stunning. I knew that even though it is small, it had so much potential to be a gorgeous outdoor oasis. I feel like we've added an entire room to our home just by creating an outdoor space everyone enjoys. You can shop the look on the Lowes website in the photo below! Wow, it looks great !! Good job! 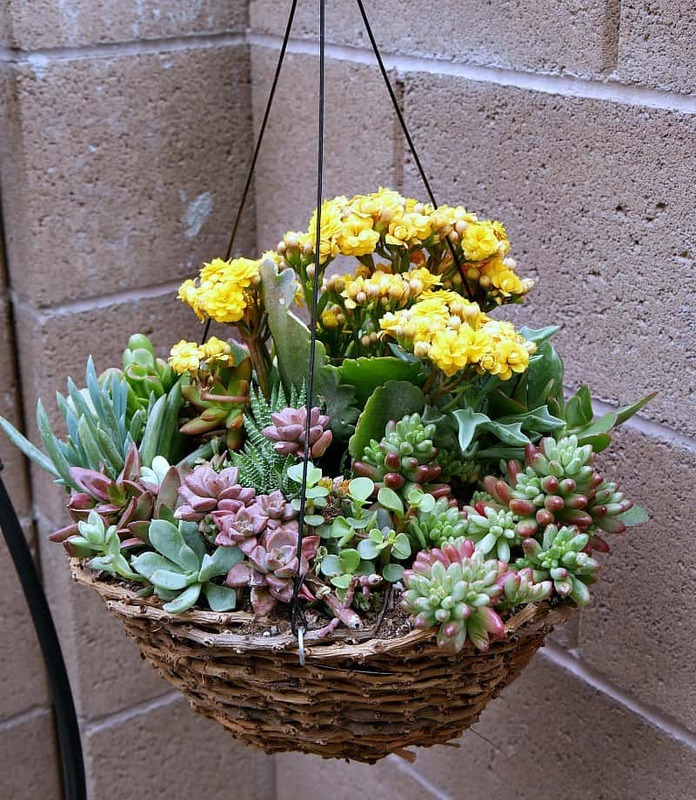 Love this we are trying to get our condo patio to be pretty we live in Phx!! Oh, and by the way – I love the pictures with your cats, too! LOL! Yes, they HAVE to be outside with us if we’re out there. WOW! You did good! 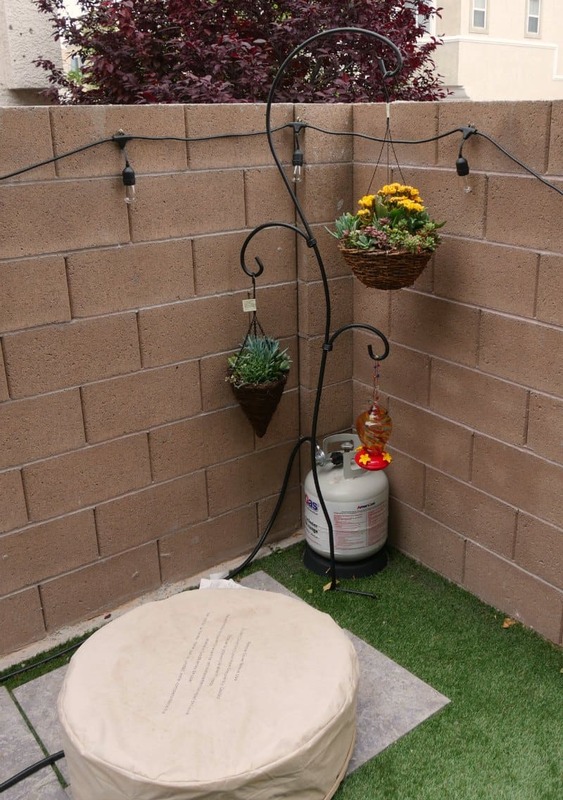 The transformation from grey cement enclosure to colorful, welcoming space is amazing. I’d love to spend time there. Gorgeous!!!! Love every bit of it!!! Very cool and brilliant thinking with colors!! 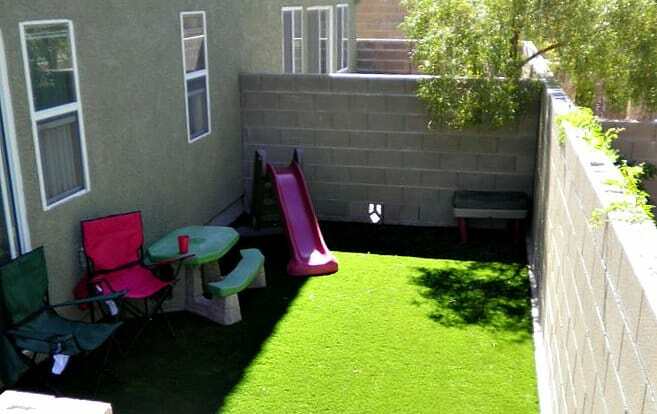 You did an amazing job with that small backyard. I love the potted flowers and the hanging plants. All looks so pretty and charming. What a great space and looks so lovely with the bright pop of colors. Thank you for sharing at Dishing it and Digging it link party. What a fun use of space! Love those lights and that welcome mat is awesome! I just bought and moved into a fourth floor unit in an older condo development in Kailua, Hawaii-the lanai is 8 x 18– and there is no water source except by hand from the kitchen. 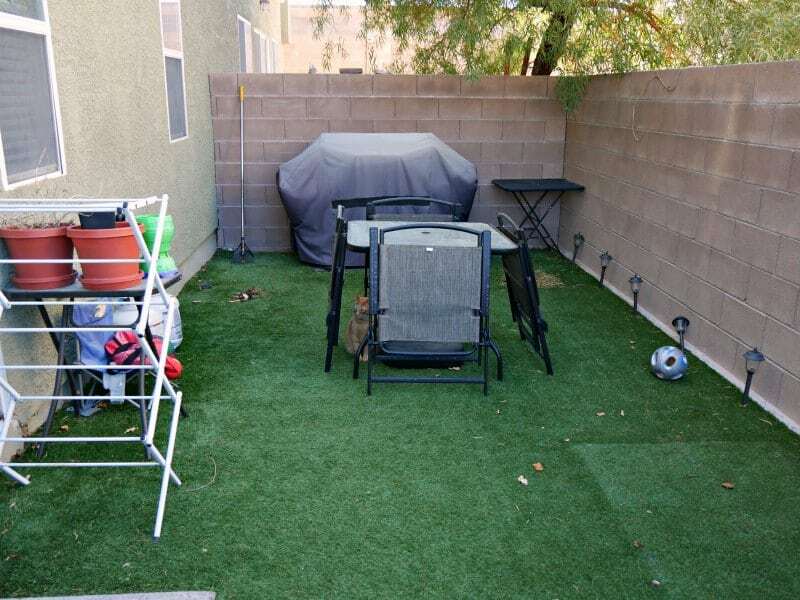 I love the photos of your “new” back yard and it definitely gives me idea for making my space one where I can entertain. Since the lanai gets strong morning sun, it will be geared for afternoon and evening gatherings. Yay! I think I know how to make this lovely. Thanks! Love it! 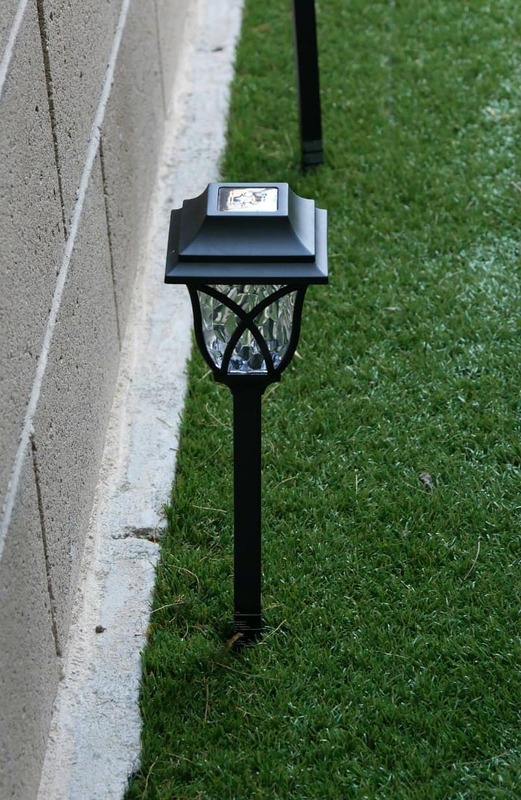 I just bought some outdoor lights for our back patio! I’d love to get some succulents like yours too! Thanks for sharing! WOW! What a makeover. I love your new backyard. Bet you spend many lovely hours relaxing there. Thank you for sharing your before and after makeover at the Snickerdoodle Create~Bake~Make link party! I am featuring your makeover at Snickerdoodle today. Wow! You did such a fabulous job. Your yard is now such an inviting place to spend an evening with the soft glow of those lights at your beautiful patio set. The fire pit is a nice touch too. This post will be featured at the new Merry Monday party beginning Sunday night at 9 pm EST. Thanks so much for sharing with us. Love this outdoor inspiration. Looks great! I am in the process of trying to figure out lights in my new backyard. I last yard was really large and now this one is quite a bit smaller. Thanks for the inspiration! omg i loooove the succulent planters. i wish they would work year round here. It never occurred to me what I’d do with them in the winter! LOL I guess I’ll worry about that in November! Thank you! I told my husband that we can totally do backyard date nights now. Super-cute makeover! I love the bright colors. You really got the most out of your small space. Your backyard looks so inviting, now. This turned out amazing! 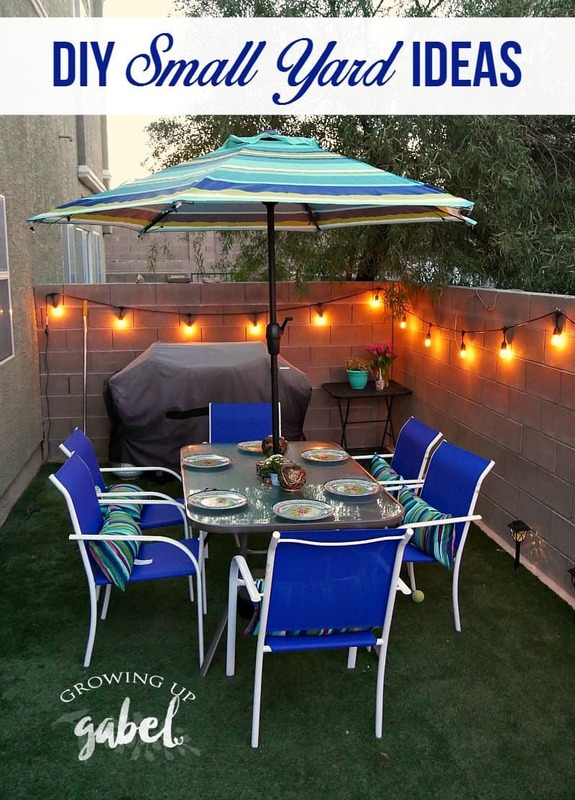 I’m really wanting to redo our patio and string lights are at the top of my list to get for it! This is beautiful. Absolutely beautiful. It’s more beautiful when all your family members come together and eat dinner together. That is a great moment. Thanks for sharing. Goegeous!! I love how colorful everything is and that it’s so welcoming! You really made the most out of a small space.